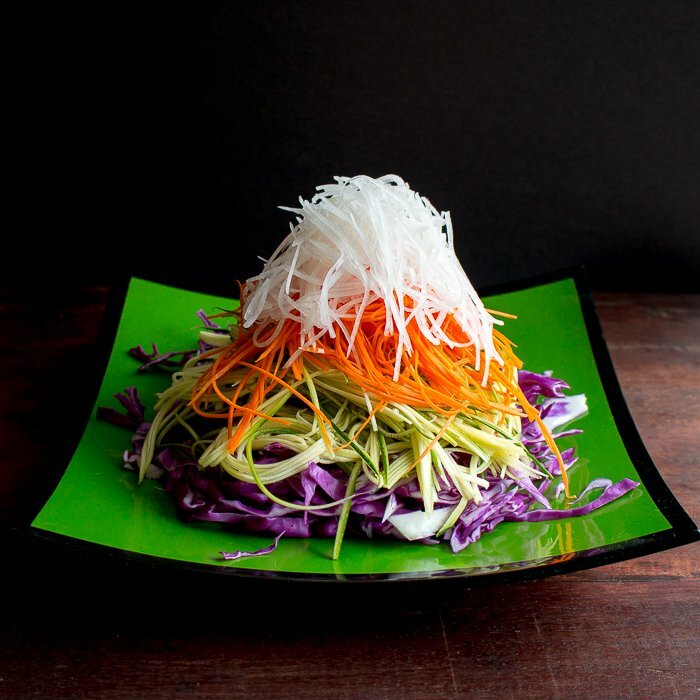 Layered High Sesame Asian Salad is piled high with healthy extra long thin vegetables and a rocking tamari ginger dressing. 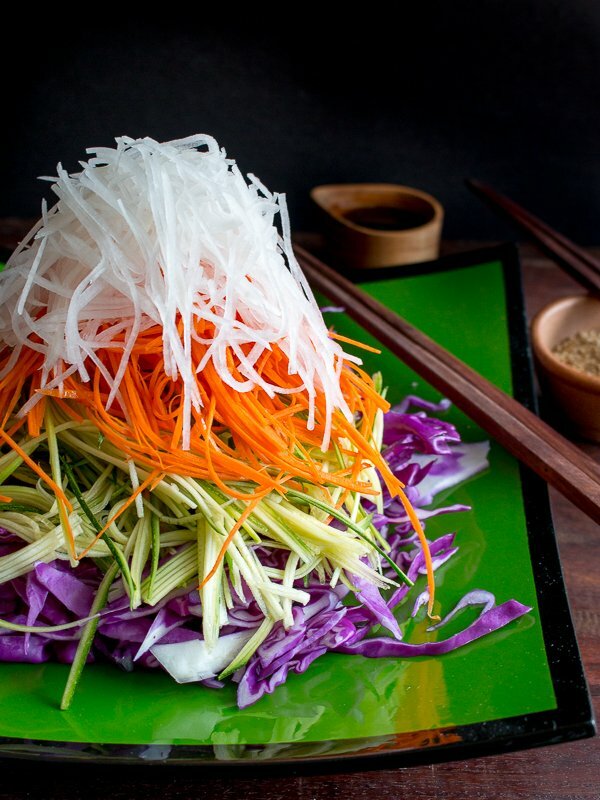 Have you ever heard of Yu Sheng? 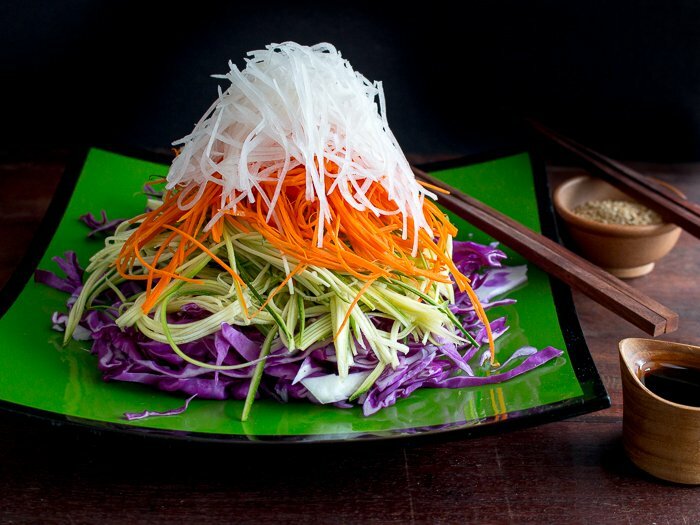 Yu Sheng is a piled high fish salad that is served on Chinese New Year (CNY). Each layer and topping has a different meaning. For example, carrots represent good luck and fortune, white radish (daikon) represents prosperity and good Career fortune, sesame seeds are for good Business Fortune and oil is for prosperity and wealth. However, we just skipped the raw fish, sashimi style as we are serving this lovely vegan salad as a side to our Asian Fusion Holiday Feast. 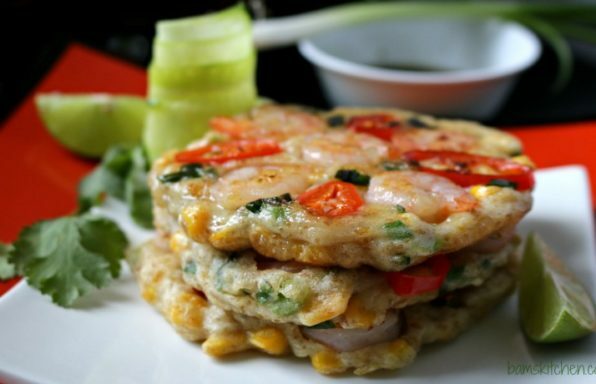 Over the last several posts, we have building a low carb Asian Infused Holiday Feast. Be sure to check out our Roasted Turmeric Spiced Turkey Breast, Garlicky Sesame Stir Fried Green Bean and for a low carb side or starter be sure to our try Skinny Spaghetti Squash Egg roll Ups too. Coming soon to a monitor to you in the stunning dessert finale for the perfect sweet ending to this delicious but guilt free meal. 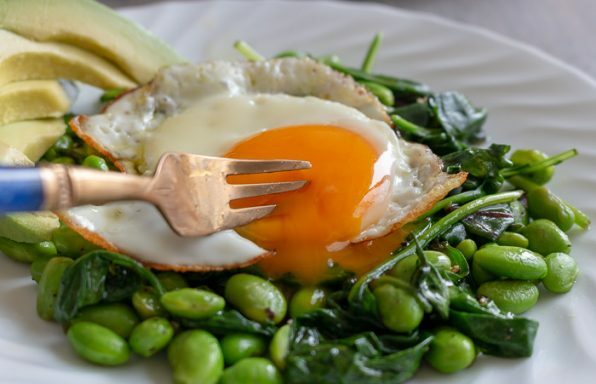 When you toss your salad at the table, lift it as high as you can before allowing it to fall back down on the plate. 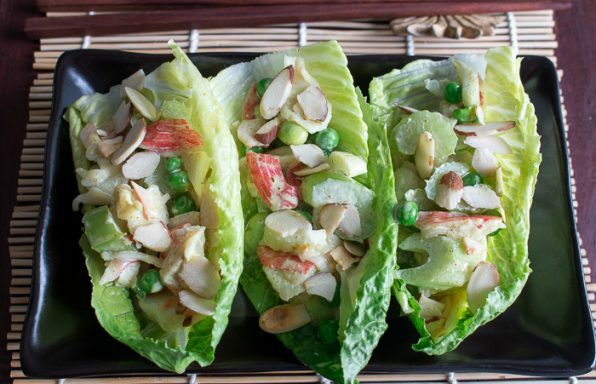 The higher the salad goes, the more prosperity and good luck you have in the year ahead. 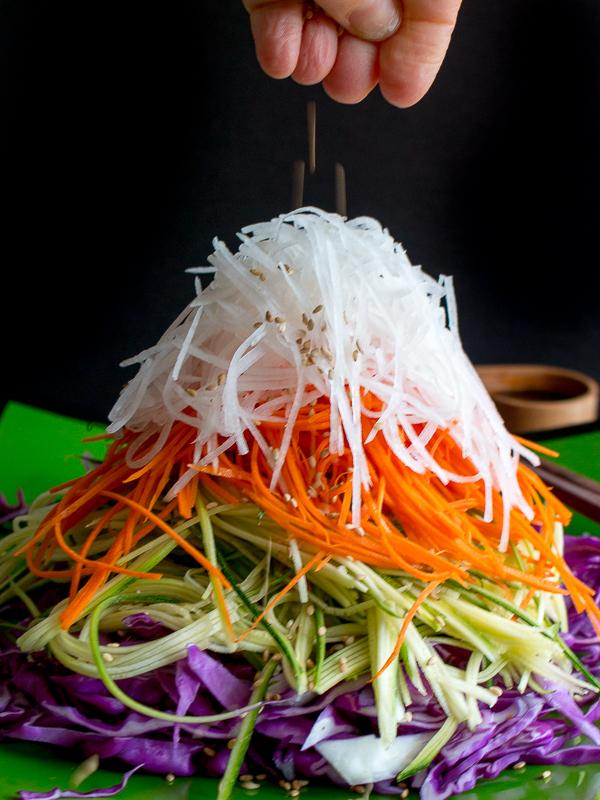 Look at how HIGH we have this Layered high sesame Asian salad stacked to the roof! It is a tower of Salad! 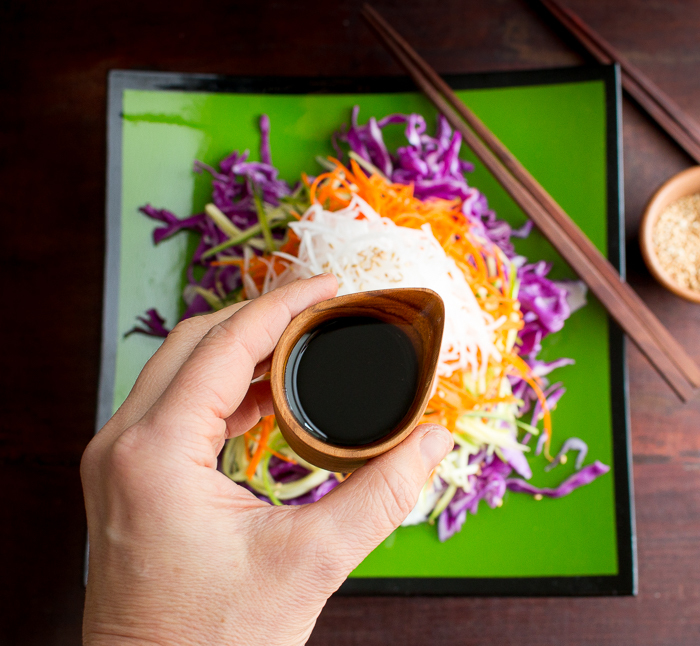 We say go big or go home and this layered High Sesame Asian Salad just rocks with our tamari ginger salad dressing. 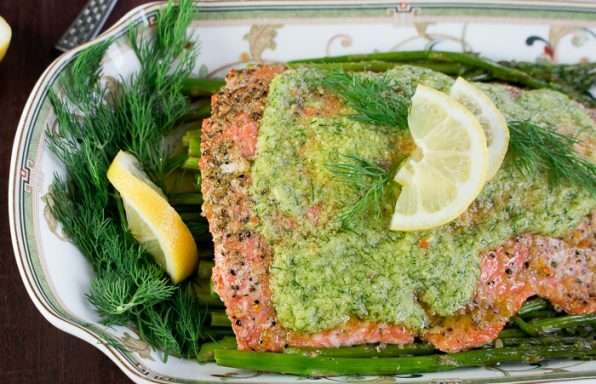 Simply delicious with a a little tamari sauce, freshly grated ginger and sesame oil. Have you ever tried our Nutty Ginger Tamari Quinoa Salad? 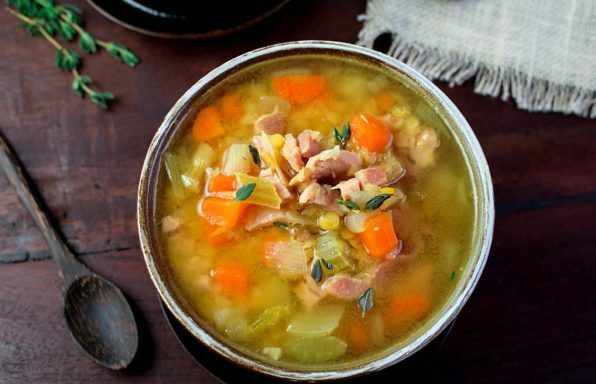 You can use any long crispy veggies you desire. We just happened to have daikon, carrot, red cabbage and zucchini in the crisper. We topped with a little toasted sesame seeds too. 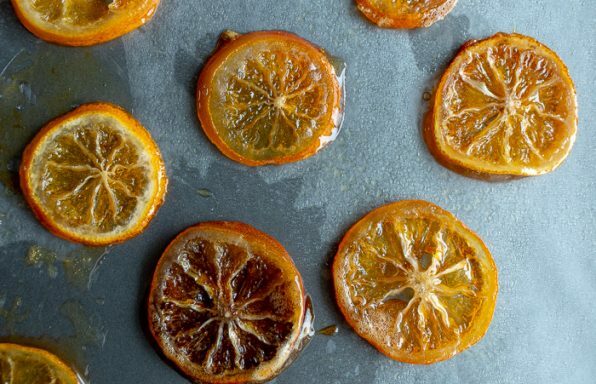 The tricky part of this recipe is using a mandolin, well maybe not tricky but challenging if you do not have a protector for mandolin. Careful as we do not want any of you running around with only 9 good fingers around the busy holiday season. Use a protector for your mandolin or a steel protector glove or better yet a handy dandy spiralizer. You are just going to love this delicious easy vegan side dish as it makes a stunning display on your dinner table. 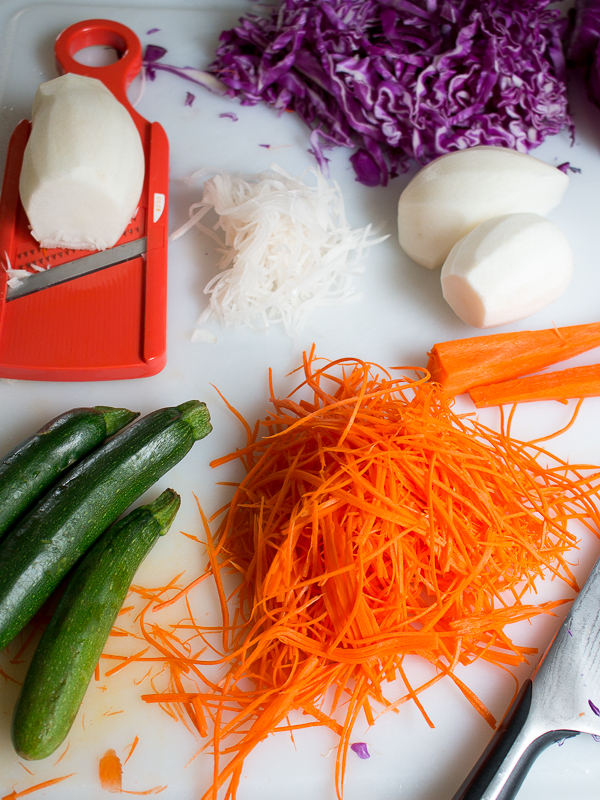 1With a mandolin slice your vegetables in thin vermicelli sized long slices or spiralizer to make long noodle like strips with your vegetables. 2On a large plate layer the red cabbage on the bottom layer, then on top of the cabbage spread a layer of zucchini, then on top of the zucchini add a layer of carrot , on top the carrot top with a topping of daikon. The goal is to make the layers as high as possible so that it looks like a mountain and gives you extra luck and prosperity in the new year. 4In a bowl add the ginger, garlic, tamari sauce, sesame oil, olive oil, sugar alternative of choice and white pepper and whisk until well encorporated. 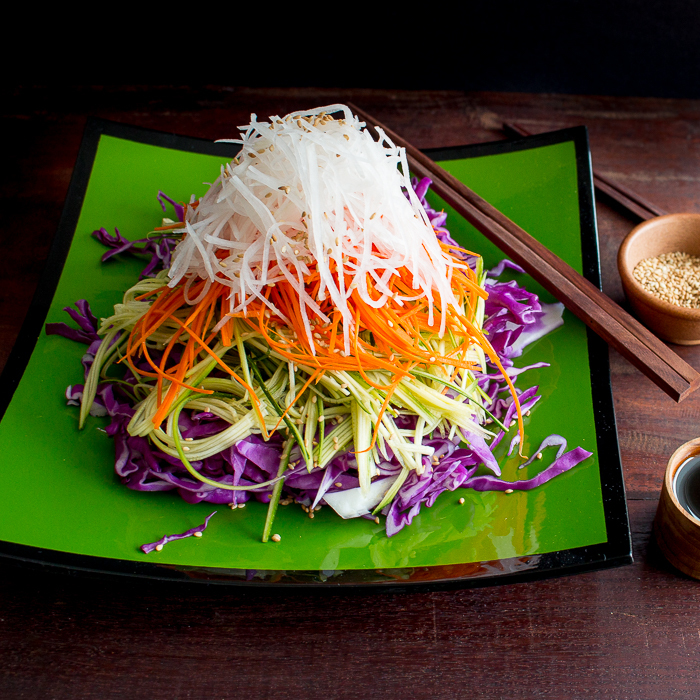 5Serve your Layered High Sesame Asian Salad with the ginger tamari dressing on the side to your dinner guests. Drizzle with the ginger tamari dressing at the dinner table and toss high with your guests to bring the best luck and prosperity in the new year.